This is embarrassing: I was totally focused on working on my R29 Thao Nguyen story, yet I neglected to buy tickets to her show at the Black Cat and it sold out! But there's a happy ending. My friend Carolyn was my indie rock fairy godmother and her boyfriend Alex graciously gave his ticket to me. So I got to see the show after all! They sounded so great, and played nearly all the songs on the new record. Thao really gave it her all. Plus, she busted out a Ludacris rap ("What's Your Fantasy"), and talked about her summer gigs pre-fame, like playing Potbelly restaurants all around NoVa and working as a bouncer at Guitar Center. 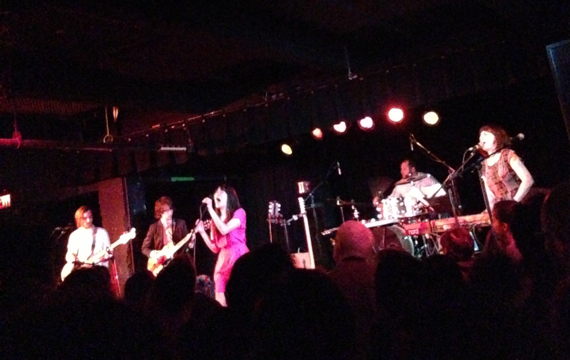 The show ended with a rendition of The Ronettes' "Be My Baby" sung by both Thao and Sallie Ford, who opened the show with her band The Sound Outside. Really good vibes! Posted in Music and tagged with Thao & The Get Down Stay Down, Concerts. March 24, 2013 by Adele Chapin.